I knew right away I’d want to do something special with them. 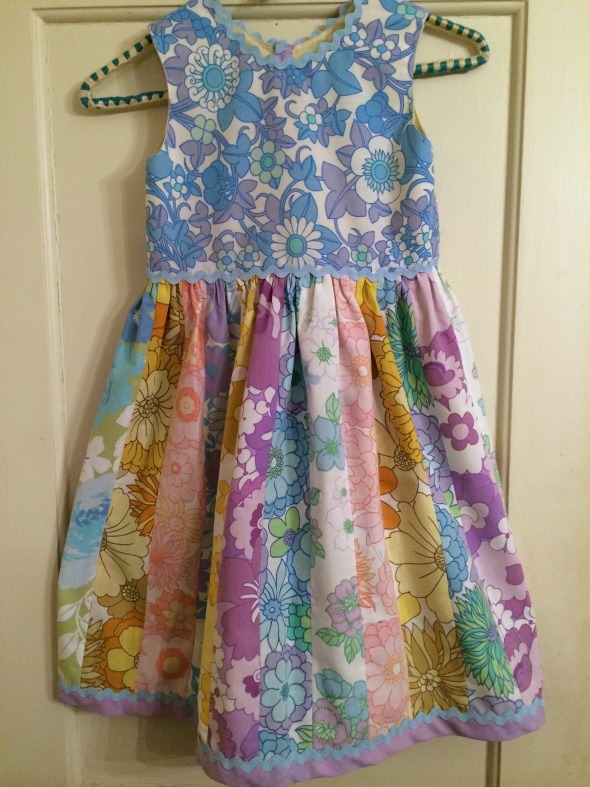 Then one afternoon while the grandkids were jumping around the house an idea suddenly clicked: I’d make a dress for my four-year-old granddaughter. 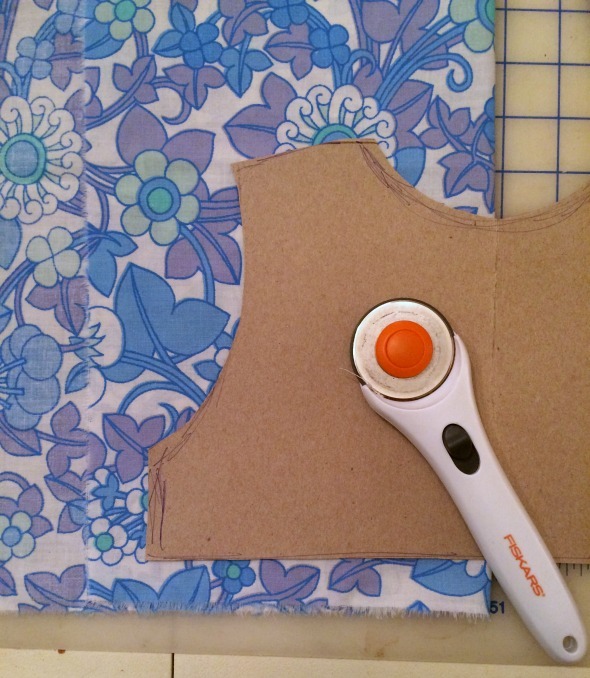 I didn’t want to waste any fabric, so I did some simple calculating. 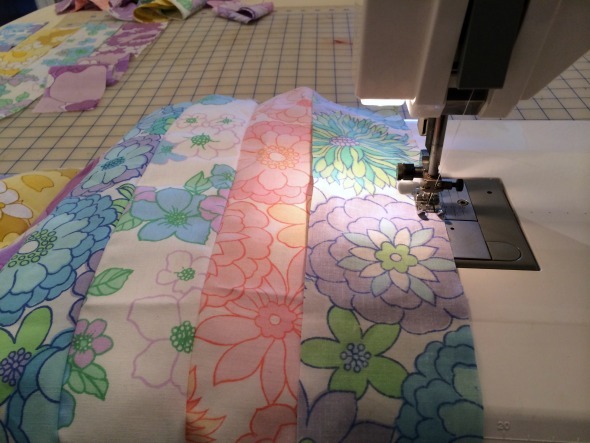 All the sheet pieces were roughly the same size and would divide into 3-inch strips. 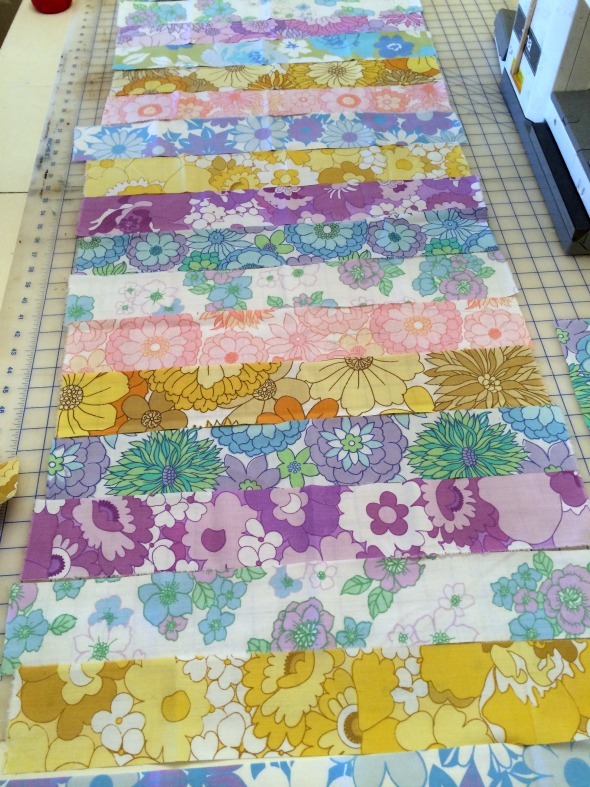 A rotary cutter and a 3-inch-wide ruler made it fast and easy to cut a pile strips. Random strips, all about the same length, waiting to be joined. I figured the skirt needed to be pretty wide to gather up and be twirly. I didn’t measure it, so don’t bother asking how long it was! I just used all the fabric I had. A few minutes later I was stitching the strips together. 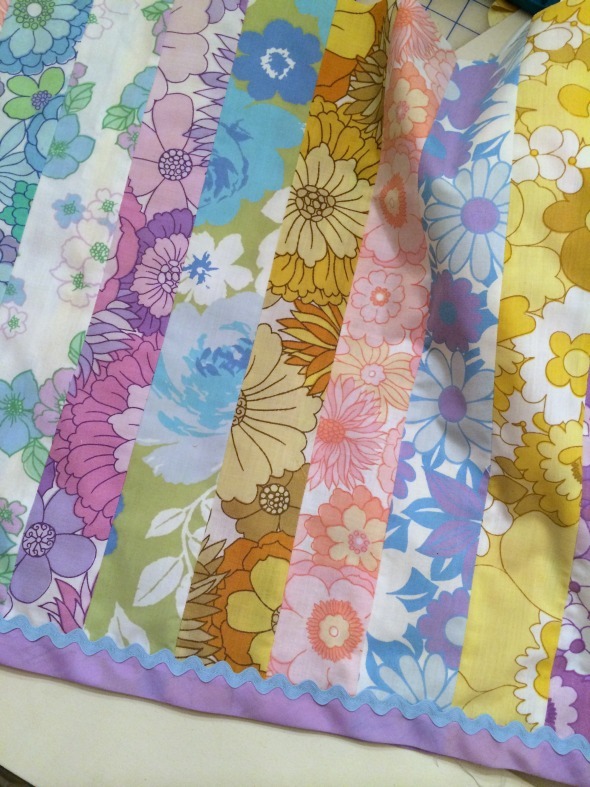 I used a 1/4″ seam and pressed them all open. The edges were zig-zagged to prevent raveling and then pieces were all trimmed to the same length. A serged seam would have been better. 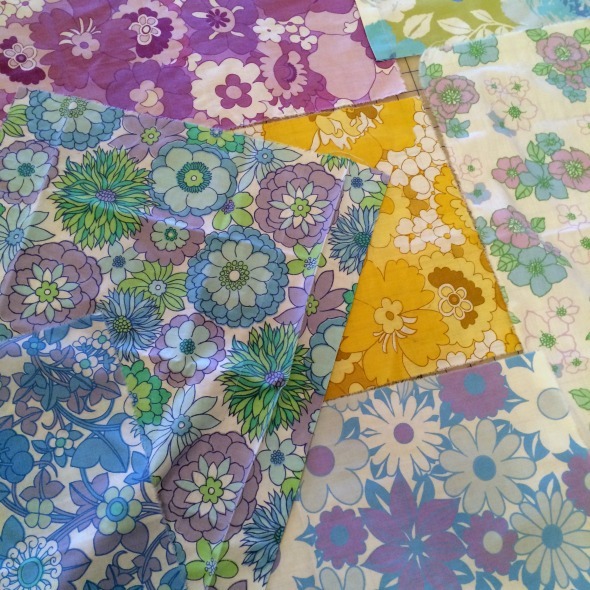 This many seams would make a hem lumpy and complicated. I decided it would be easier to finish off the bottom with some vintage trim. I’ve got so much of it hoarded! Turquoise, purple, jadite! I love them all! They all looked so good together. 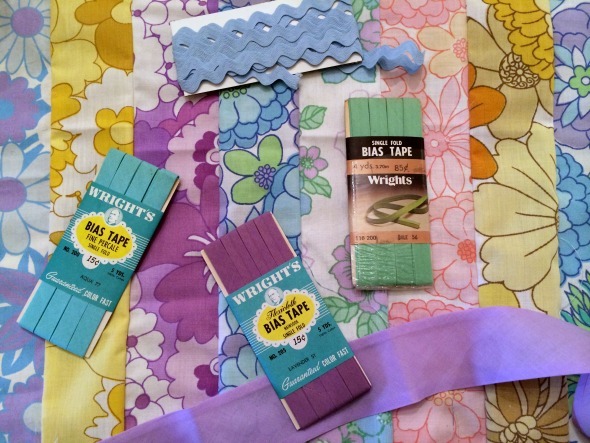 But I narrowed my choice to blue rick rack and lavender double fold bias tape. Hide that raw edge! 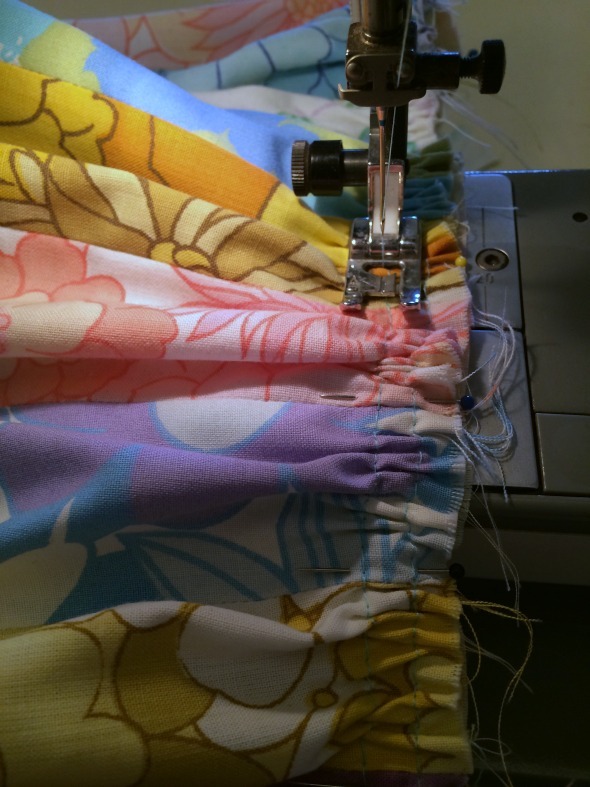 I stitched both pieces of trim on the bottom of the skirt before sewing the back seam. It’s not Vogue, it’s Rice Chex! 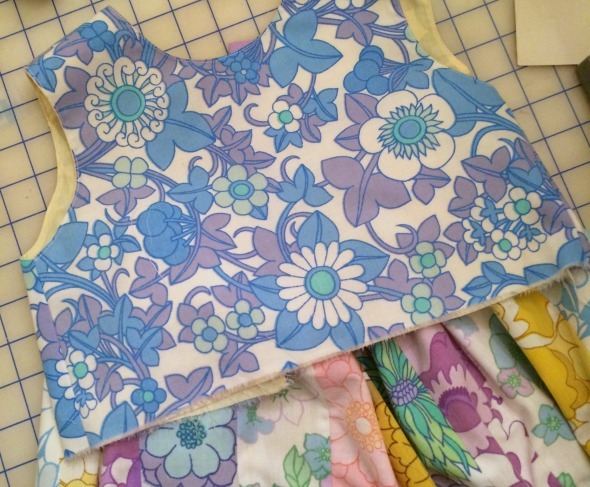 I scrounged a piece of pale yellow fabric out of my stash for the bodice lining. You can’t see it here, but the back is two sides, made to lap over. Stitching the skirt to the bodice. All day long I kept hearing, “Grandma, is my dress done yet? Grandma, is my dress done yet?” Well, I was sewing as fast as I could! We picked out three shimmery, mother of pearl buttons from my thrift store stash. They’re perfect! And at last, the Big Reveal! Ta da! She loves it! I do, too. It’s loooong and pretty roomy. I bet she’ll even be able to wear it next spring. I’m told she wore it to preschool the next morning and jumped around telling everybody, “My grandma made me a dress! My grandma made me a dress! My grandma made me a dress!” Thanks, @adabea1! You helped make two people feel like a million bucks! “A cereal box from the recycle bin”–yes, you are your father’s daughter. 🙂 The dress is gorgeous and that hem is genius! Ah yes, I forgot about that part! I still have the cardboard pattern Dad used to plan the angle for the legs of weaving bench he made me. Thank you, but it’s just the result of messing around with fabric for 50+ years. Beautiful! I love that rick rack finish! Gosh you would have made a 51 year old happy if you made it in my size! Super sweet. Thank you, Laurie! 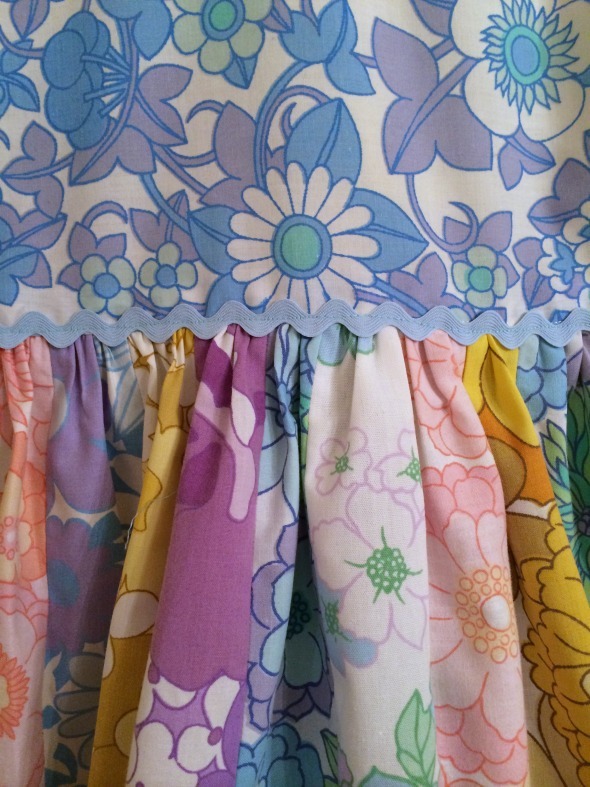 Check out gertrudemade.com for fabulous vintage sheet dresses in adult sizes. Drool worthy! She’s on IG, too. It’s so cute! Wish I could have seen it on Lucy! I’m sorry, but I didn’t want to put her photo on the internet.